The climate is warming. You know this. Why continue the deceit? Climate science denial is a cult. There’s more deceit in claiming warming, when it’s been practically at a standstill over the last couple of decades. It’s a far cry from the nightmare scenarios you’ve been painting. Or produce evidence of warming — or have I asked for evidence previously? I’ll answer Stephanie’s misleading reference for the sake of our glorious bystanders. For 2013 and 2014, I found that only 5 of 24,210 articles and 4 of 69,406 authors rejected anthropogenic global warming, showing that the consensus on AGW is above 99.9% and likely verges on unanimity. – The Consensus on Anthropogenic Global Warming Matters, by JL Powell, 2017. The 97% consensus on anthropogenic global warming (AGW) reported by Cook et al. (2013) is a robust estimate. Really? Cook’s oily little study examined 11,944 abstracts and reported that 97.1% of them agreed with the consensus on man-made global warming. However, examination of Cook’s data by Andrew Montford suggested (it was hard to be certain) that only about 41 of those abstracts actually agreed with the consensus. That’s 0.3%. There is a clear upward trend in the UAH chart that you linked to. Note also that UAH is a radiance proxy of the lower troposphere which is not the same thing as surface temperatures. Verheggen, Bart; Strengers, Bart; Cook, John; van Dorland, Rob; Vringer, Kees; Peters, Jeroen; Visser, Hans; Meyer, Leo (19 August 2014). “Scientists’ Views about Attribution of Global Warming”. Environmental Science & Technology. American Chemical Society. 48 (16): 8963–8971. doi:10.1021/es501998e. All indicate a scientific consensus between 90-100%. A good read is Joseph Leonard Fone’s On the Shoulders of Heretics. It’s a major threat to our existance. it’s the greatest challenge of our time. it has to be “addressed”. we have to fight/combat climate change. you’re a science/climate change denier. you’re a shill for the fossil fuel industry. it’s as “real” as gravity. it’s a “heat trapping” gas. ” 97%” of scientists agree. every scientific institute on the planet says so. You’re a right wing nut. Yeah, it’s the same old crap we hear , year after year, from you AGW brainwashed, naive, gullible, looney pack of true believers. Sensors indicate that Dennis Horne entered a wormhole in space-time and re-emerged as Stephanie Hawking, having transitioned in time, space and gender, but not in general obnoxiousness. I have lessened my advocacy of real Physics vs warmism of late. The reason is that our discussions on blogs like Tallbloke etc led me to make a prediction. That the Quiet Sun Effect would play out just like it now is doing. Shorter growing seasons, frigidity, limp ENSO, etc., are doing the arguing for us. The proof will be evident or not within two years, is my guess. I see the Greens’ Parliamentary CC commitee is starting soon, with full decisions for next year. We know what is likely from it, but we could still be shocked – they are nuts after all. But an election comes the following year. There has been no significant T rise globally for two decades. In spite of fraudulent record tampering, of which we have the orginal data. The Models are a scandalous waste of money, and IPCC knows it. Stephen Hornekings can only throw insults. Simon would not know a Significant Difference if he walked into it. It could get very boring hearing these crooks. But much real science continues apace, such as new ozone source discoveries at the magnetic polar flux convergences. Currently two in the north, and one south of Oz. Rewriting of ozone science was overdue, and looks imminent. Holes? Quite natural. Well, you’re just a breath of fresh air, Brett, thank you. Thanks for that info re the ozone holes Brett. I always thought that we didn’t know enough about them (ozone holes) back in the 80’s for scientists to make the claims that they did then. Regarding early & late frosts, well out here on the Manawatu plains we haven’t had one yet, but came close last week when heavy winter-like snow settled low on the beloved Tararuas. Not that unusual as snow has been recorded there in every month of the year in my 60+ years. The unusual thing about the mountain snow for this time of the year was that it lingered for more than a day or so. Another thing about last week’s cold snap is that it gave us Palmerston North’s coldest April day in the past 43 years (unfortunately I don’t have daily data going beyond 1975), and the 11th of April was also the earliest recorded sub-10C maximum day by a month for the same period. Sub 10C days usually don’t happen here until into June & even July. A handful have happened in May with the previous two earliest examples occurring during the cold Mt Pinatubo affected autumn of 1992. The main reason that we haven’t had a frost yet is that it has been too wet since the start of the year. Now, as will rightly be pointed out, this is just weather, but it cuts both ways. 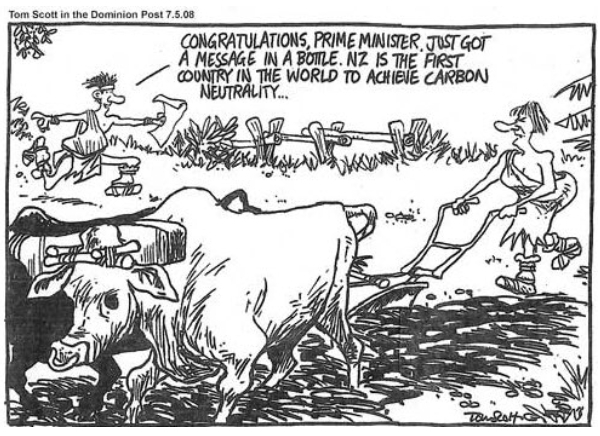 This recent summer has been touted as the hottest on record by NIWA (by just 0.1 of a degree in the mean temps for Dec-Feb) and yet N.Z.’s hottest Day record set 45 years ago still stands, much to the chagrin of J.Salinger & co. I well remember the glee followed by great disappointment back in Feb 2011 when it looked like identical weather circumstances that created the 1973 record were about to repeat at Timaru only for it to come up short. Oh dear, how sad, never mind! The warmistas would have jumped on a new record and shouted it out from the roof tops as ‘evidence’ that it was all our fault. It was Salinger & Trevor Chinn who blamed humanity for the loss of all of the ice from N.Z. glaciers in modern times, completely ignoring how much ice melted away in the period from when the Little Ice Age ended (around 1850) through to when our CO2 input was deemed significant (around 1950). If we were to compare the ice mass loss as a percentage of the original 1850 amount and the two periods in question, i.e. 1850-1949 & 1950-2018, nature would win hands down. I can easily say that without knowing the actual figures, because nature is mostly responsible for the ice mass loss period! This recent summer has been touted as the hottest on record by NIWA (by just 0.1 of a degree in the mean temps for Dec-Feb) and yet N.Z.’s hottest Day record set 45 years ago still stands, much to the chagrin of J.Salinger & co. I well remember the glee followed by great disappointment back in Feb 2011 when it looked like identical weather circumstances that created the 1973 record were about to repeat at Timaru only for it to come up short. And NIWA was striving to break that record again this last summer but was once again thwarted. I recall summers in Melbourne in the 70’s when periods of up to 10 days recorded daily temperatures between 36 and 42ºC. 1969 – 1972 was a drought for Southern Victoria. All of Melbourne was on water restrictions for over two years. Climate is changing, but are current events unique? Definitely not! Ian et al: I was at Massey PNth 2001-04, doing a BApplSc and Grad Dip 40yrs late, and the winter snow came down heavy on the saddle. Cyclical, as the locals told me. But it was part of the start of retreat from the warmists’ hoped-for hell. Having fluked it and lived a full cycle, I’ve seen it before. Similar to about 1960 we are now, roughly, but never exactly. Soon – claims of a returning ice age from the usual idiots. Sorry children, just Piers’ mini LIA! Joe Bastardi uses analogues to predict possible shorter growing -seasons. That, and stupidity wrecking our affordable heating, makes for a threatening situation. But the Simons and Hornekings of the world have that sorted – it is arctic warming causing a frozen north, still snow-covered way above previous satellite-era levels. We must abhor affordable warmth still just to please them. Okay warmistas, apres-vous….. I love this blog. Everyone who contributes knows something of the history of the matter or the matter itself I’ve never heard of. It’s a fascinating adventure, greeting my inbox of a morning! Thank you all. Germany won’t be able to meet the goal of cutting emissions by 20 percent before 2020. But the attempt caused residential energy prices to double. 1% of current GDP is around $2.7 billion per annum. By 2050 of course we’d expect GDP to have increased (if only with inflation), but if we think of the emissions goal as reducing GDP in 2025 by up to 25% relative to the baseline, the sums are absolutely enormous, even discounted back to today’s dollars.